Drip irrigation is a type of micro-irrigation system that has the potential to save water and nutrients by allowing water to drip slowly to the roots of plants, either from above the soil surface or buried below the surface. The goal is to place water directly into the root zone and minimize evaporation. Drip irrigation systems distribute water through a network of valves, pipes, tubing, and emitters. Depending on how well designed, installed, maintained, and operated it is, a drip irrigation system can be more efficient than other types of irrigation systems, such as surface irrigation or sprinkler irrigation. Primitive drip irrigation has been used since ancient times. Fan Shengzhi shu, written in China during the first century BCE, describes the use of buried, unglazed clay pots filled with water, sometimes referred to as Ollas, as a means of irrigation. Modern drip irrigation began its development in Germany in 1860 when researchers began experimenting with subsurface irrigation using clay pipe to create combination irrigation and drainage systems. The research was later expanded in the 1920s to include the application of perforated pipe systems. The usage of plastic to hold and distribute water in drip irrigation was later developed in Australia by Hannis Thill. Usage of a plastic emitter in drip irrigation was developed in Israel by Simcha Blass and his son Yeshayahu. Instead of releasing water through tiny holes easily blocked by tiny particles, water was released through larger and longer passageways by using velocity to slow water inside a plastic emitter. The first experimental system of this type was established in 1959 by Blass who partnered later (1964) with Kibbutz Hatzerim to create an irrigation company called Netafim. Together they developed and patented the first practical surface drip irrigation emitter. In the United States, the first drip tape, called Dew Hose, was developed by Richard Chapin of Chapin Watermatics in the early 1960s. Chapin Watermatics was acquired by Jain Irrigation in 2006 and is housed under its US subsidiary Jain Irrigation Inc, USA. After its first introduction in California in the late 1960s, only 5% of irrigated land utilized this system by 1988. By 2010, 40% of irrigated land in California utilized this system. Modern drip irrigation has arguably become the world's most valued innovation in agriculture since the invention in the 1930s of the impact sprinkler, which offered the first practical alternative to surface irrigation. Drip irrigation may also use devices called micro-spray heads, which spray water in a small area, instead of dripping emitters. These are generally used on tree and vine crops with wider root zones. Subsurface drip irrigation (SDI) uses permanently or temporarily buried dripperline or drip tape located at or below the plant roots. It is becoming popular for row crop irrigation, especially in areas where water supplies are limited, or recycled water is used for irrigation. Careful study of all the relevant factors like land topography, soil, water, crop and agro-climatic conditions are needed to determine the most suitable drip irrigation system and components to be used in a specific installation. In drip irrigation systems, pump and valves may be manually or automatically operated by a controller. Most large drip irrigation systems employ some type of filter to prevent clogging of the small emitter flow path by small waterborne particles. New technologies are now being offered that minimize clogging. Some residential systems are installed without additional filters since potable water is already filtered at the water treatment plant. Virtually all drip irrigation equipment manufacturers recommend that filters be employed and generally will not honor warranties unless this is done. Last line filters just before the final delivery pipe are strongly recommended in addition to any other filtration system due to fine particle settlement and accidental insertion of particles in the intermediate lines. 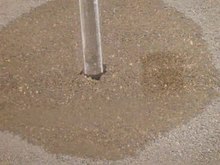 Because of the way the water is applied in a drip system, traditional surface applications of timed-release fertilizer are sometimes ineffective, so drip systems often mix liquid fertilizer with the irrigation water. This is called fertigation; fertigation and chemigation (application of pesticides and other chemicals to periodically clean out the system, such as chlorine or sulfuric acid) use chemical injectors such as diaphragm pumps, piston pumps, or aspirators. The chemicals may be added constantly whenever the system is irrigating or at intervals. Fertilizer savings of up to 95% are being reported from recent university field tests using drip fertigation and slow water delivery as compared to timed-release and irrigation by micro spray heads. Properly designed, installed, and managed, drip irrigation may help achieve water conservation by reducing evaporation and deep drainage when compared to other types of irrigation such as flood or overhead sprinklers since water can be more precisely applied to the plant roots. In addition, drip can eliminate many diseases that are spread through water contact with the foliage. Finally, in regions where water supplies are severely limited, there may be no actual water savings, but rather simply an increase in production while using the same amount of water as before. In very arid regions or on sandy soils, the preferred method is to apply the irrigation water as slowly as possible. Pulsed irrigation is sometimes used to decrease the amount of water delivered to the plant at any one time, thus reducing runoff or deep percolation. Pulsed systems are typically expensive and require extensive maintenance. Therefore, the latest efforts by emitter manufacturers are focused on developing new technologies that deliver irrigation water at ultra-low flow rates, i.e. less than 1.0 liter per hour. Slow and even delivery further improves water use efficiency without incurring the expense and complexity of pulsed delivery equipment. 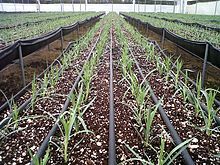 An emitting pipe is a type of drip irrigation tubing with emitters pre-installed at the factory with specific distance and flow per hour as per crop distance. An emitter restricts water flow passage through it, thus creating head loss required (to the extent of atmospheric pressure) in order to emit water in the form of droplets. This head loss is achieved by friction/turbulence within the emitter. Fertilizer and nutrient loss is minimized due to a localized application and reduced leaching. Field leveling is not necessary. Soil type plays a less important role in the frequency of irrigation. Water distribution is highly uniform, controlled by the output of each nozzle. The risks of degrading plastic affecting the soil content and food crops. With many types of plastic, when the sun degrades the plastic, causing it to become brittle, the estrogenic chemicals (that is, chemicals replicating female hormones) which would cause the plastic to retain flexibility have been released into the surrounding environment. Drip tape is a type of thin-walled dripperline used in drip irrigation. The first drip tape was known as "Dew Hose". Drip tape duct tape is made of polyethylene and is sold flat on reels. The wall thickness typically ranges from 4 to 25 mils (0.1–0.6 mm). Thicker walled tapes are commonly used for permanent subsurface drip irrigation and thinner walled tapes for temporary throw-away type systems in high-value crops. Water exits the tape through emitters or drippers. The typical emitter spacing ranges from 6 to 24 inches (150–600 mm). In some products, the emitters are manufactured simultaneously with the tape and are actually formed as part of the product itself. In others, the emitters are manufactured separately and installed at the time of production. 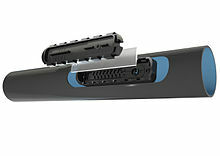 Some product is not a tape, but a thin-walled dripperline, but in popular parlance, both types of products are called tapes. Typical tape diameters are 5/8", 7/8", and 1-3/8", with the larger diameters more commonly used on permanent installations with longer runs. Drip tape is a recyclable material and can be recycled into viable plastic resins for reuse in the plastics manufacturing industry. Drip irrigation is used in farms, commercial greenhouses, and residential gardeners. 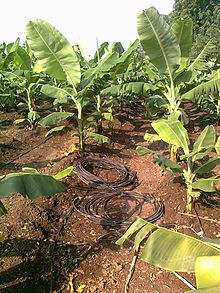 Drip irrigation is adopted extensively in areas of acute water scarcity and especially for crops and trees such as coconuts, containerized landscape trees, grapes, bananas, ber, eggplant, citrus, strawberries, sugarcane, cotton, maize, and tomatoes. Drip irrigation for garden available in drip kits are increasingly popular for the homeowner and consist of a timer, hose and emitter. Hoses that are 4 mm in diameter are used to irrigate flower pots. ^ Bainbridge, David A (June 2001). "Buried clay pot irrigation: a little known but very efficient traditional method of irrigation". Agricultural Water Management. 48 (2): 79–88. doi:10.1016/S0378-3774(00)00119-0. Retrieved 23 October 2013. ^ a b R. Goyal, Megh (2012). Management of drip/trickle or micro irrigation. Oakville, CA: Apple Academic Press. p. 104. ISBN 978-1926895123. ^ a b "The History of the Drip Irrigation System and What is Available Now". www.irrigation.learnabout.info. ^ "The History of Drip Irrigation". ^ ‹See Tfd›, ‹See Tfd›Roberts, James C., "Drip irrigation tape"
^ "US Patent # 5,387,307. Drip irrigation tape and method of manufacture - Patents.com". www.patents.com. Retrieved 2017-09-30. ^ ‹See Tfd›, ‹See Tfd›Leal-Diaz, Jaime, "Hoses for irrigation by dripping and the like and the process to manufacture the same"
^ "Jain Irrigation". www.JainsUSA.com. Retrieved 19 December 2017. ^ India, Press Trust of (2006-05-03). "Jain Irrigation buys Chapin for $6 mn". Business Standard India. Retrieved 2017-09-30. ^ User, Super. "New AG International - Jain Irrigation Announces Acquisition of Chapin Watermatics Inc". www.newaginternational.com. Retrieved 2017-09-30. ^ Taylor, Zilberman, Rebecca, David (26 July 2015). "The Diffusion of Process Innovation: The Case of Drip Irrigation in California" (PDF). ^ Yang, Chun Z.; Yaniger, Stuart I.; Jordan, V. Craig; Klein, Daniel J.; Bittner, George D. (1 July 2011). "Most Plastic Products Release Estrogenic Chemicals: A Potential Health Problem That Can Be Solved". Environmental Health Perspectives. 119 (7): 989–996. doi:10.1289/ehp.1003220. PMC 3222987. PMID 21367689. ^ "DEW-HOSE Trademark - Registration Number 0847046 - Serial Number 72249303 :: Justia Trademarks". trademarks.justia.com. Retrieved 2016-06-12. 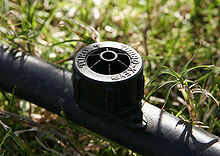 Wikimedia Commons has media related to Drip irrigation. This page was last edited on 12 April 2019, at 22:16 (UTC).